Will Fights Over Money End Your Marriage? HomeBlog Personal FinanceWill Fights Over Money End Your Marriage? Believe it or not, one recent study done by the Bank of Montréal found that the reason why many couples divorce is because of money and not due to infidelity. In fact, many of the couples that were surveyed said that they would be more willing to forgive a spouse that cheated then to overlook money problems. In fact, 68% of those surveyed indicated that fighting over money would be their number one reason for divorce. The love of money is the root of many evils and divorce is certainly one of them. Several different surveys have shown that people that can communicate effectively over family finances are more likely to stay married than those that don’t. A survey commissioned by SmartMoney and Redbook in 2004 found that at least 70% of couples talk about their finances once a week. The problem is most people don’t know how to do this effectively. They tend to get very emotional and over reactive about their finances and not strategic. If you want to keep money from ending your marriage there are some mistakes to not make. Many experts say that it’s wrong to merge all your money. When couples do this it can lead to endless arguments or to one of the two feeling that his or her needs are not being met. A better answer might be called yours, mine and ours. In other words, each partner might keep some of her or his money separately but with a joint account for joint expenses such as mortgage payments, rent, groceries, insurance and so forth. In other words, each should have some independent money or money they can do with as they wish. Unfortunately, this can be tough if one of the two comes to the marriage with a lot of debt. But if you both start with a fairly clean slate then finding a way to combine your finances without feeling as if the other person is watching every one of your financial moves can cut down considerably on fighting. As time goes by you may find that combining all of your finances is just a lot easier. But don’t rush this unless you’re both comfortable with it. 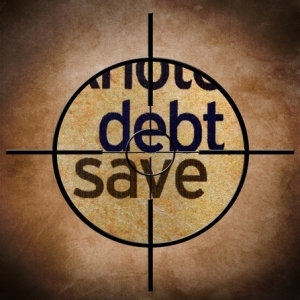 Dealing with debt is one of the areas where many couples have the most disagreement. They often can’t agree as to how much debt is too much debt and what kind of debt is good debt. It can make the situation even worse if one spouse comes to the marriage with a lot of debt. What’s the answer to this? Whether you like it or not once you get married your spouse’s debt can become your problem. Legally speaking you aren’t responsible for your spouse’s credit card bills before you were married or for any loans he or she opened – assuming you keep your finances separated. But even at that your spouse’s credit score will affect the ability for the two of you to get joint credit. If one of you does have a lot of debt but you are not married it could make sense to talk about a pre-nup to make certain the assets that one of you brings to the marriage will be shielded from the other’s creditors. The second most common reason why couples fight is over spending. He comes home with a new 50-inch, flat-screen HDTV that he got on “such a deal” while you think the money should’ve been saved or spent on something more practical. What often happens is one spouse gets labeled as the “bad guy” and is blamed for skimming from the joint checking account. However, research has shown that men and women just spend differently though they spend about the same amount of money. What this really boils down to is a problem of perception. The solution? Create a budget. The two of Sit down and decide how much money you’ll allocate to the everyday things of life and how much to save for the large purchases. That way you’ll take the surprise out of your spending. The survey done by SmartMoney magazine also found that men are more likely to be risky when it comes to investing then their wives. In fact, 62% of the men were more willing to take risks versus 19% of the women. But it doesn’t do much good to fight about your investments based on whether or not you’re willing to take risks. A better solution is to talk about your investment goals and time frames. As an example of this, you could decide to not take risks with the money you’ll need for the next year but be more willing to take risks with your retirement savings. If setting goals and time frames doesn’t solve the problem you may need some help form a certified financial planner. Regardless of what investments you choose you need to sit down and review your investments together annually to make sure your investment portfolios balance each other out. Would you be shocked to learn that most couples do keep secrets about money from each another? When survey found that 36% of men and 40% of women said they had lied to their spouse about the price of something they had purchased. This is the most prevalent secret. Whether or not this is a problem depends on how you deal with it. The fact is that many people lie to themselves about their spending. If your husband managed to squirrel away $200 to buy a new golf club that probably wouldn’t be much of a problem. However, if he or she has been putting away thousands of dollars in a secret savings account, it could be time to talk with a financial professional. Whether you want to think of it this way or not if this happened in a company, it would be called embezzlement. Most couples are under such financial stress these days that any little emergency could tip them into trouble. If you both earn a good living and are not worried about debt but run into an emergency you could find you’re totally unprepared. Many of the couples surveyed found that if they ran into an unexpected emergency they might panic, which could lead to bad decisions. All couples need to have an emergency fund the equivalent of three or six months’ worth of living expenses tucked away somewhere safe. Just knowing the money is there can eliminate stress since you will know that you’re not dancing a thin line between being comfortable and suffering a catastrophe.